Set off from Cancun on a thrilling adventure across the waters of Nichupté Lagoon. 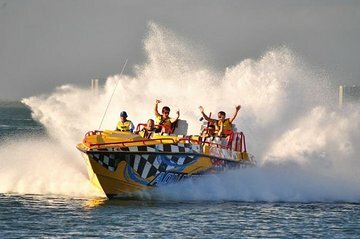 For 30 minutes you'll whip, zip, and bounce over waves in a high-speed jet boat, twisting and turning in all directions. The swampland is home to such wildlife as white turtles and crocodiles, so keep an eye out for them between the captain's adrenaline-inducing maneuvers. There's also a major chance you'll get soaked, so dress accordingly. The boat is very fast, very smoothe, and can turn very quickly. A great thrill for those who have never been on a boat and don't mind getting splashed and then doing 30mph for extended periods, freezing cold. I have been in a boat before; and i felt that the stunts were too tame and slow paced. Upon arriving at Aqua World, there was confusion and lack of communication by the staff, which put us in incorrect lines twice, resulting in us being the only 2 people standing in the tour group with our clothes on and tickets in hand, while 30 other people had already put their clothes in lockers, were wearing bathing suits and life jackets and submitted their tickets to the staff. We stood there feeling like idiots, since no one would help us. Finally, after receiving assistance and getting onboard the boat, the ride was great and definitely worth doing.